The Singapore Grand Prix just passed wasn't really up there in the entertainment stakes with some of the other races of this campaign. Not before the near-inevitable safety car appearance at any rate. Nevertheless it contained some reason for cheer, for a few drivers at least. This was because it contained a rather odd concentration of strong performances from those who really needed them. And pronto. First off is Felipe Massa, whose refuge at Williams this season after Lord-knows-how-long in the graveyard shift at Ferrari has often had something of the out the frying pan, into the fire about it. A few noted that other than replacing Fernando Alonso's name as the team mate trouncing him with Valtteri Bottas's it was hard to see the join. His place at Williams for 2015 never seemed under serious threat, but still what remained of his reputation was continuing to take a bit of a battering. Massa however got his first podium for his new team at Monza two weeks beforehand, yet while that was a worthy effort some mused nevertheless that his team mate and therefore yardstick Bottas was severely delayed at the start. But none of this applied in Singapore, with Massa putting in a fine run to fifth place, leaving his much-vaunted stable mate way behind. And for all that he bemoaned having to drive 'like a grandmother' in order to keep his tyres in shape late on, he did so to much better effect than Bottas, who gave us a striking demonstration of what hitting the cliff looks like (Massa's tyres were a lap older too). We have seen before with Massa in 2012 that a breakthrough podium appearance after a long time away can have a transformational effect on him. We've also seen that when everything is aligned he can produce performances that without hyperbole rank alongside the best of absolutely anyone - his magical qualifying lap at this very same venue in 2008 is considered totemic among these. Possibly these two factors came together last weekend. Whatever was the case he looked on top of the two Grove pilots for much of the proceedings. Then there is Jean-Eric Vergne, who like Massa was the star of the Singapore night show from a few viewpoints. Certainly his star was the more spectacular of the two. Vergne is someone I see as rather underrated; a proper talent and a proper racer. He is someone that I placed ninth in a mid-season 2014 driver rating, which a few disagreed with but I feel that wretched luck with reliability largely accounted for him not achieving a points total this year that would have done him much greater justice. And his getting the Toro Rosso chop infamously for 2015 just after the summer break reflected the strict Replicant-style lifespan of a Faenza pilot more than any assessment of what he was doing on track. Furthermore when paired alongside Daniel Ricciardo before about the only distinction between the two was the Australian's qualifying abilities, Vergne often appearing edgy and error-prone therein. This year by his own admission he focussed heavily upon this, and he seems to have fixed it. So, with Danny Ric wowing us this campaign, you do the maths. Since Vergne got his abrupt notice of dismissal from his employer he's had two weekends wherein he'd been out-qualified and out-raced by his young stable mate Daniil Kvyat, and the Frenchman was a quintessential model of midfield mediocrity throughout both. I worried that - given his fate - perhaps he'd either checked out, or that somehow the focus of the team had migrated to the other side of the garage. 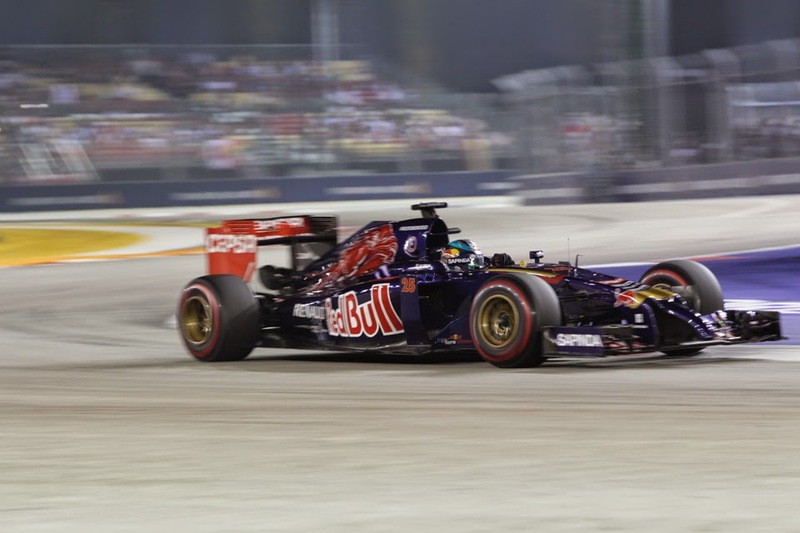 When Kvyat qualified ahead again in Singapore it seemed mere continuation. But Vergne on race day soon rectified that, sailing past the Russian early on, and not even letting two five-second penalties for exceeding track limits spoil his day. After pitting with 16 laps left, and emerging in P14 behind even a Caterham, Vergne gobbled up the road before him as well as plenty of opponents on the way to P6 at the end in a scintillating finale, getting the five seconds he needed over the next guy so not to be docked a place on the very final lap. Murmuring even started in Singapore that Vergne may yet be rescued by another F1 team for 2015 (Sauber was mentioned), though as is usually the case it'll depend in large part on whether he can gather some money. 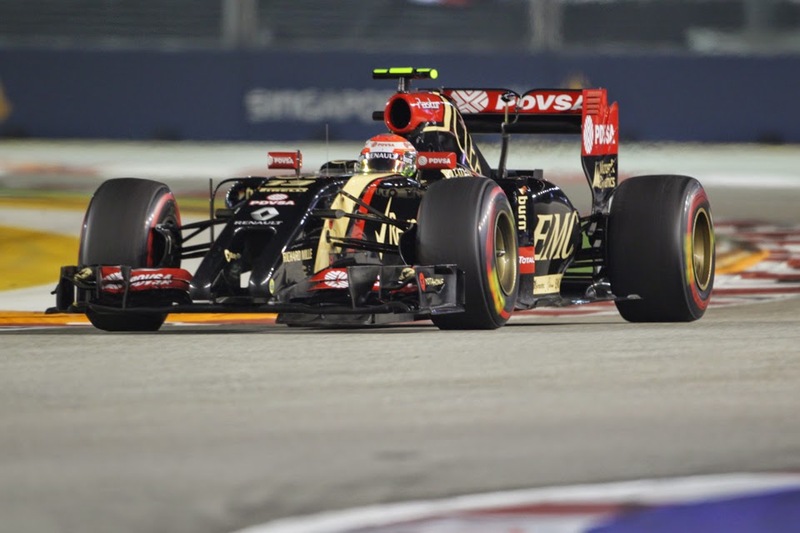 And in discussions of F1 pariahs it would seem remiss not to include Pastor Maldonado. It's just as well therefore that he was another to claw himself back from an abyss ever so slightly on Singapore's race day. Veteran readers of this site (hello to both of you) will know by now that I'm something of a defender of Pastor. A task that, you'll appreciate, isn't always easy. There undoubtedly are mistakes in him. Probably by now without his bulging briefcase of cash he wouldn't be in F1 (let's not forget though that he entered the sport's top echelon as GP2 champion, beating plenty of worthy drivers in so doing). But some of the vitriol he receives I feel is ridiculous and way above and beyond the evidence actually provided on track. Such is his reputation he receives no benefit of any doubt, and the bile sent his way immediately upon any error seems a reaction for many akin to Pavlov's Dog. Worse it often has the odd parallel with a lynch mob. Sure enough it followed when he wiped off a front corner of his Lotus on one of this track's uncompromising walls in Friday practice. Generally though the evil E22 is no machine for anyone to show their wares, and stands in rather stark contrast with the Williams that Pastor passed up for this season (another fact that some don't need much encouragement to point out). He appears rather to have had the majority of the team's reliability woes this campaign too. Yet he's also maintained a brave face at it all, being resolutely positive and optimistic (something which his stable mate hasn't managed), as well as infallibly open and friendly with the media, many representatives of which rip him to shreds in print as soon as his back his turned. And the bottom line is this season when the car has held together Pastor has tended to perform solidly, in races at least (his prangs - the infamous one in Bahrain aside - have been mostly contained in practice and quali). He actually - in a stat that may surprise - has yet to retire from a race this year due to an accident. He only did so once in the 2013 campaign too. And while the other Lotus pilot Romain Grosjean left him far behind earlier in the season, latterly Pastor's been showing signs of getting with the programme. In the last two rounds indeed he's finished ahead of the two after respectable drives. 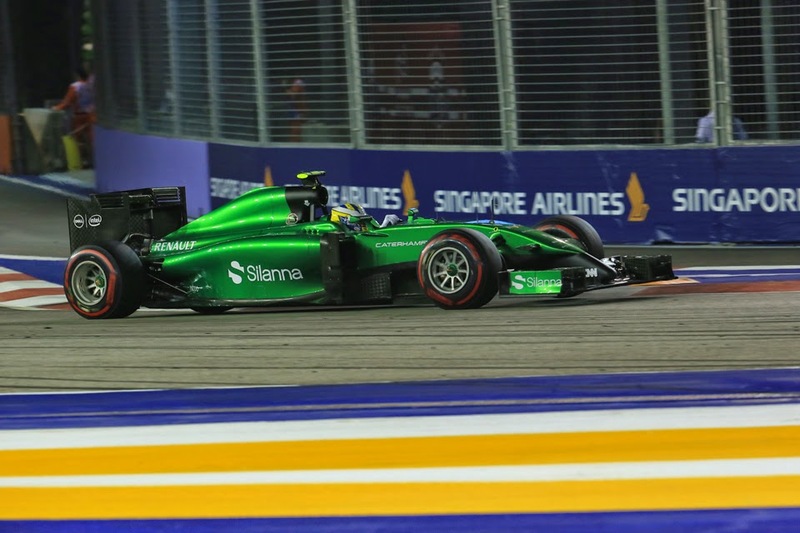 This included in Singapore, where indeed Pastor was placed in the points with just six laps left before a close to inevitable worn-tyres induced slide down the order to P12. And let's not forget how highly-rated Grosjean is. He left Kimi Raikkonen behind plenty when all was well also. We can add to this tale of reclamation finally perhaps an even more unlikely figure of Marcus Ericsson. In making his freshman F1 campaign in a Caterham this year he can hardly be accused of setting heather alight. Nevertheless though he was gradually getting to grips with things in what was a difficult car, and one hanging off the back of the pack. There were however a few knives out for Ericsson, particularly recently when in Spa and then in Monza it seemed whoever hopped into the other Caterham at however short notice was immediately putting heavy manners on him. In the case of Andre Lotterer in Spa and of Kamui Kobayashi in Monza their best qualifying laps were around a second under the best that the Swede could muster in the same session. As was noted by Martin Brundle it all seemed rather curious, and made you wonder exactly what was going on there. An instant response might be to decry Ericsson as not being good enough, but it should not be forgotten that there was nothing in his GP2 record to suggest that he is an idiot (albeit not a world-beater either). Perhaps given Caterham's well-documented struggles lately the team's ability to prepare two cars to the same level has been diminished? We don't know of course, but for what it's worth this indeed appeared to be the case in Colin Kolles's previous cash-strapped F1 team, at HRT in 2012 (Narain Karthikeyan the possible victim them). Singapore however is a happy hunting ground for Ericsson, him having finished second here twice in GP2. Again though he qualified far from the pace of his team mate, albeit to some extent explained by an electrical problem. In the race things came good for him however, starting with him rebuffing (an admittedly severely hobbled) Nico Rosberg coolly early on, staying in close company with Jules Bianchi, then getting ahead by eschewing a third tyre stop, before keeping Bianchi behind at the last despite extremely second-hand rubber. It was the first time he'd topped the B class in the finishing order, and a few reckoned it was his best drive of the year. We could probably add Sebastian Vettel's name to these too. Perhaps Sergio Perez also. 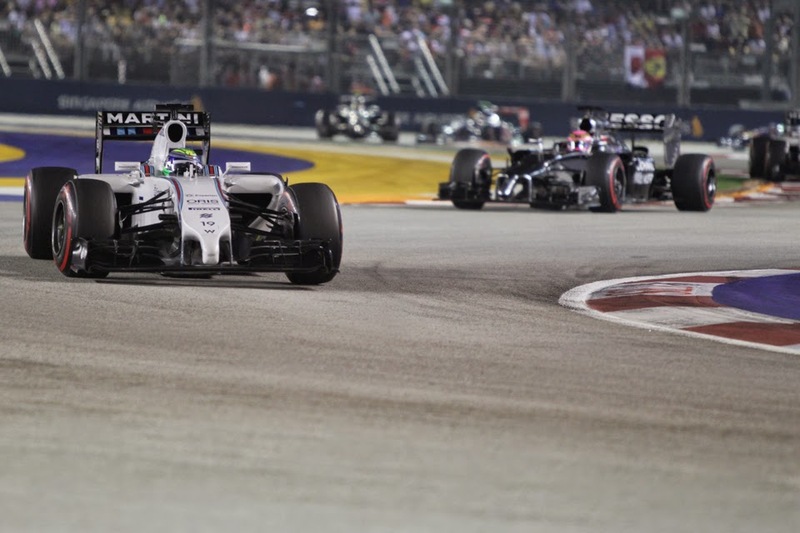 For whatever reason, peculiarly the Marina Bay circuit last Sunday rather doubled as a road to redemption.